This image from the NASA/ESA Hubble Space Telescope shows the galaxy cluster MACS J0416.1–2403. This is one of six being studied by the Hubble Frontier Fields programme, which together have produced the deepest images of gravitational lensing ever made. Image released Oct. 22, 2015. The Hubble Space Telescope has identified the largest known collection of faint galaxies in the early universe. Hubble relied on a massive magnifying glass formed by nature itself to spot more than 250 dwarf galaxies that existed just 600 million to 900 million years after the Big Bang. Some of these galaxies apparently helped end the universe's so-called "dark ages," researchers said. To look back so far in time, the study team relied on a phenomenon known as gravitational lensing, in which the gravity of a massive foreground object bends and magnifies light emitted by background objects. This image from the NASA/ESA Hubble Space Telescope shows the galaxy cluster MACSJ0717.5+3745. This is one of six being studied by the Hubble Frontier Fields programme, which together have produced the deepest images of gravitational lensing ever made. Image released Oct. 22, 2015. In the new study, three enormous galaxy clusters served as the foreground objects, amplifying emissions from the faint, distant dwarf galaxies. 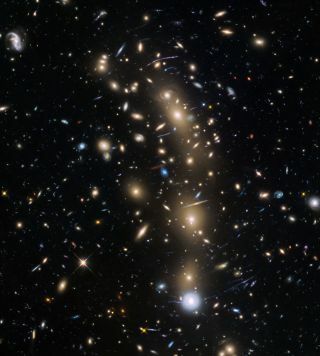 Using the deepest images of gravitational lensing produced by the three clusters, which were taken as part of the Hubble Frontier Fieldsprogram, study team members were able to spot galaxies lying more than 12 billion light-years away. "Clusters in the Frontier Fields act as powerful natural telescopes and unveil these faint dwarf galaxies that would otherwise be invisible," co-author Jean-Paul Kneib, from the Ecole Polytechnique Fédérale de Lausanne, Switzerland, said in the same statement. In addition to identifying the largest collection of faint early galaxies, the astronomers also determined that those galaxies' lightcould have helped bring the dark ages of the universe to an end through the process of "reionization." The "dark ages" refer to the period before light could travel freely. Hydrogen gas blanketed the early universe, blocking the light from the first stars and galaxies. By studying the ultraviolet light produced by the distant collections of stars studied in this research, the astronomers determined that the smallest and most abundant galaxies in the newfound collection could have been major players in clearing out the gas to make the universe transparent. The scientists also determined that reionization epoch likely ended about 700 million years after the Big Bang (which occurred 13.82 billion years ago). "If we took into account only the contributions from bright and massive galaxies, we found that these were insufficient to reionize the universe," said study lead author Hakim Atek, of the Ecole Polytechnique Fédérale de Lausanne. "We also needed to add in the contribution of a more abundant population of faint dwarf galaxies." Abell 2744, nicknamed Pandora’s Cluster, was the first of six targets within the Frontier Fields programme, which together have produced the deepest images of gravitational lensing ever made. The cluster is thought to have a very violent history, having formed from a cosmic pile-up of multiple galaxy clusters. The Frontier Fields program will continue to study even more galaxies, utilizing an additional three galaxy clusters, researchers said. "The sheer depth of the Hubble Frontier Field data guarantees a very precise understanding of the cluster magnification effect, allowing us to make discoveries like these," said co-author Mathilde Jauzac, from Durham University in the United Kingdom and the University of KwaZulu-Natal in South Africa. The results of the study will appear in the Astrophysical Journal. A preprint is available online. Hubble is a joint mission involving NASA and the European Space Agency.